The Cold War is a perfect setting for video games, thanks to the intrigue brought by the underground conflict between intelligence agencies, proxy wars and so on. While most video games released so far focused mostly on the open war scenarios of the era, few have allowed players to take part in the conflict between intelligence agencies. If you ever dreamed of being a CIA or KGB operative during those turbulent times, you definitely need to take a look at Phantom Doctrine: very few games have managed to get as close as possible to being a spy simulator. Phantom Doctrine is set at the peak of the Cold War. Players will take on the role of the leader of The Cabal, a secret organization which is charged to prevent a global conspiracy to break out in the open. Players have the opportunity to choose the background of their main character between CIA and KGB, with a third one available after completing the game once, slightly changing the opening sequences of the game, but this doesn’t influence their main task, which is to recruit secret agents with varying backgrounds from all over the world. Phantom Doctrine sports a very interesting way to tell its story, with two different modes, Regular and Extended. Regular mode already offers a doubtless satisfying experience, with a story that’s filled with conspiracy, betrayal and some unexpected developments, but if that is not enough, Extended further expands things, providing a more complete picture of the global conspiracy The Cabal has to stop at all costs. Things obviously don’t stray too far from the Cold War setting, but everything is so gripping that those who love historical based settings will not be disappointed, as everything is extremely believable and coherent with its setting. At times, Phantom Doctrine’s story may become difficult to follow, due to the complexity of the scenario, but this isn’t the only complex feature the game sports. The gameplay experience is heavily influenced by the X-COM series, with players having to engage in both tactical and strategic missions. 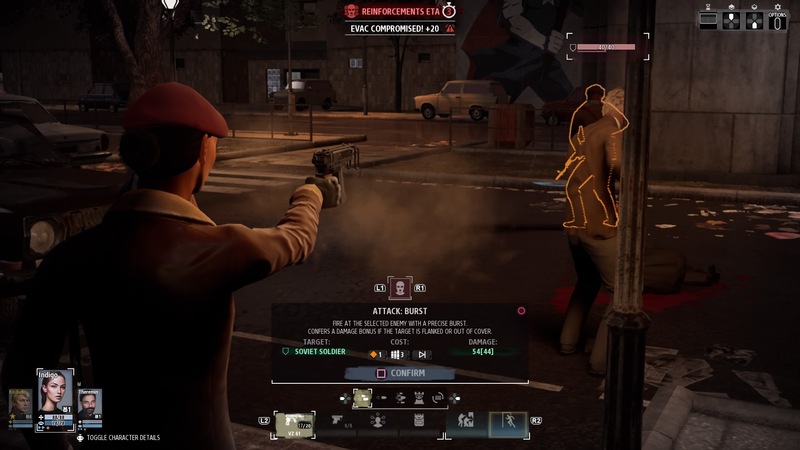 In tactical missions, players take control of a squad of secret agents, infiltrating buildings and completing a variety of objectives, such as recover documents or kidnap select units. Tactical missions are turn-based, with player and enemy taking turns to move their units and perform actions. Movement and actions are governed by Action Points while attacking is governed by both Action and Fire Points. 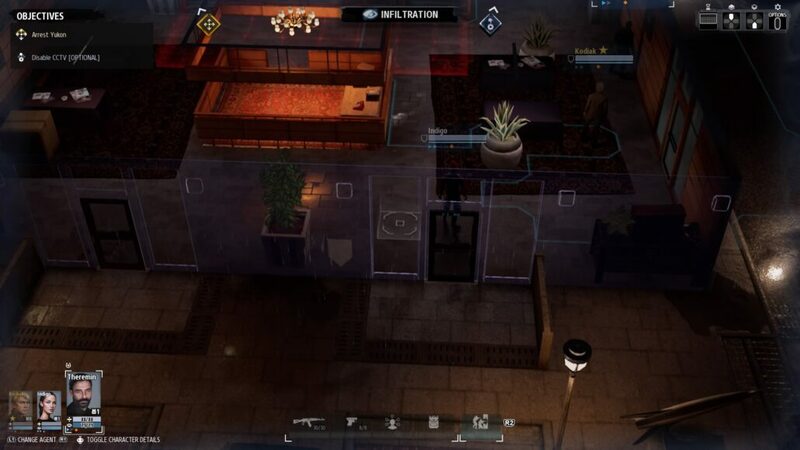 At the beginning of each tactical mission, player’s units begin in Infiltration mode, moving around non-surveilled areas, where they won’t be attacked by enemy units. Entering critical areas and getting discovered inside them will make the identity of the player’s units known, and they will be engaged by the enemy. The whole action is mostly stealth-focused, with the game giving players a lot of tools to complete missions without being discovered by the enemy, such as muffled weapons, the ability to wear disguises and so on. While a careful and stealthy approach pays off the most, the game also offers plenty of tools to make it out of a gunfight. As stated above, attacking enemy units is regulated by AP and FP, which allow players to use the equipped weapons and different shooting techniques, like headshots. Hitting is never up to chance in Phantom Doctrine, as dealing damage is regulated by Awareness: the higher it is, the lower damage is done, not counting armor, which further reduces it. Awareness management can be tricky, as it is also used to unleash some particularly useful abilities which can make a difference when things get though. Another important assault option is Breach, which allows two or more units to enter a room simultaneously and shoot at enemy units. Overwatch is also particularly important while defending a select position. All these mechanics are definitely difficult to grasp quickly, but thankfully the game does a very good job at explaining them with a tutorial mission at the beginning of the game. Things get even more complicated at the headquarter. Here, players have the chance to manage units, send them to the infirmary to recover from wounds received during missions, craft new equipment and take part in strategic missions. These missions work differently from tactical ones, with players sending agents all over the world to discover potential scouts, investigate targets and so on. There’s a time limit for each strategic mission, and players can choose between different approaches to complete them successfully. In extreme cases, players can also choose to launch an assault, which is played as a tactical mission. Failing some of these missions, like eliminating scouts, also increases danger level. If too high, the headquarter itself will be in danger, forcing players to relocate, with a huge loss of funds. At the headquarter, players will also have to engage in another, fundamental activity: investigation. Investigations are carried with a classic pinboard and string approach, where players will have to connect the dots of acquired information to get at the bottom of the conspiracy. This feature, in particular, is quite engaging, making the game feel like a true spy simulator. Units management is, as expected, quite deep, allowing for high levels of customization. For starters, all units’ appearance can be changed by using an in-depth character creator which is actually tied to the story. As units take part in missions, their identity will eventually be discovered, and changing their appearance is the only way to go incognito again. The various backgrounds also feature a high level of detail, such as perfect replicas of passports and so on. Units will also improve their abilities during missions, earning experience and leveling up. Once leveled up, units can be sent into Training, which improves proficiencies with weapons and even unlocks new action abilities. Perks are also in, further improving units’ performance. Additionally, further customization is allowed by the Body Engineering facility, which gives players the option to modify units primary stats. With complex and deep mechanics and so many things to keep track of, Phantom Doctrine is far from being an easy game. The easiest difficulty setting is the recommended one if you’re new to this type of game, while the other settings are suited for tactical masters who love a good challenge. Ironman Mode is for the true masochists, as it disables manual saves during tactical missions and forces players to start over from the beginning in case of death. 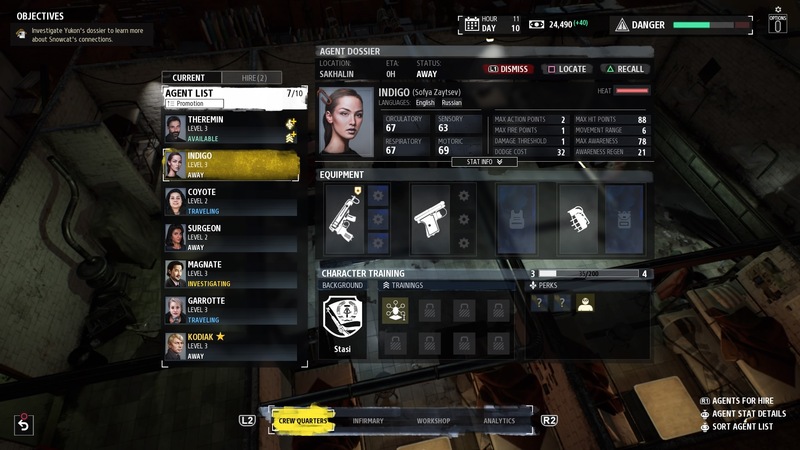 Phantom Doctrine also has something even for those who complete the campaign multiple times, a multiplayer mode sporting different maps and classes. Phantom Doctrine’s presentation is also in line with its setting, with realistic units and locations sufficiently detailed. The menu system is a bit complicated to navigate with a joypad, and the font is a tad too small, making it difficult at times to read, especially if you’re not sitting too close to the screen. Performance has its highs and lows on regular PlayStation 4, but this is hardly a problem for a turn-based game. 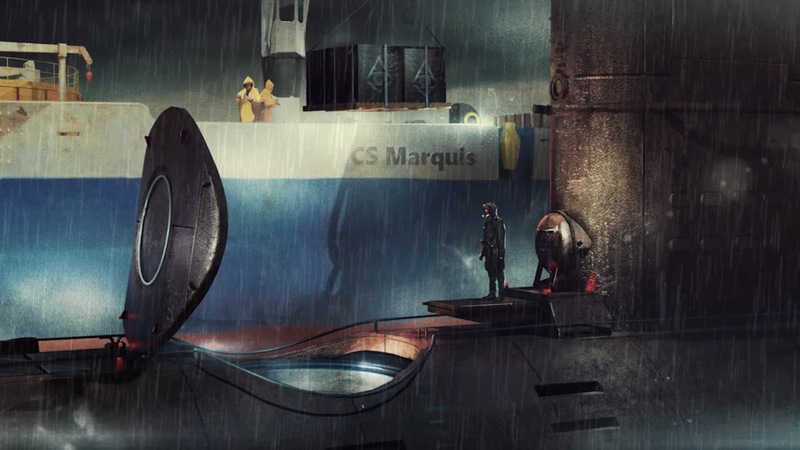 The soundtrack is also acceptable, and the voice acting, which features voice-overs in different languages, depending on the speaker, greatly helps immersion. With its immersive experience and deep, complex mechanics, Phantom Doctrine is the closest we have gotten so far to a true spy simulator. Unfortunately, this comes with a cost, as it definitely isn’t a game for everyone. Turn-based fans will love it, especially if they are fans of the XCOM series and of historic settings, while others would do well in trying the game first, as Phantom Doctrine’s complex mechanics can be quite a turn-off. Phantom Doctrine is the closest we ever got so far to a true spy simulator. With both tactical and strategic missions, deep and complex mechanics, and investigation features, playing the game will make players truly feel in control of a secret organization out to save the world from the mostly deadly world conspiracy ever. The game gets a bit too complex at times, however, so it is definitely not a game for everyone.